Traditionally, every object in nature belongs to one of three groups: animal, vegetable or mineral. But in reality the distinction between the three is not so clear-cut because the groups are closely related to each other through the medium of water. Groups of minerals form rocks, and weathering causes these rocks to break down into clay and other particles. If we investigate rocks and clay in detail, we can shed light on the processes at work in nature and this allows us to map out the history of the Earth. In the quest to solve these mysteries, it is important to conduct thorough and detailed observations and at the same time always to remain humble as we reveal the awe-inspiring magnificence of nature. Mr. Kota Kinutani values learning from nature and he is a unique sculptor who, in a very real sense, feels that he can communicate with the rocks he uses in his work. He is in constant conversation with the rocks as he hits them with his chisel and turns them into magnificent works of art. 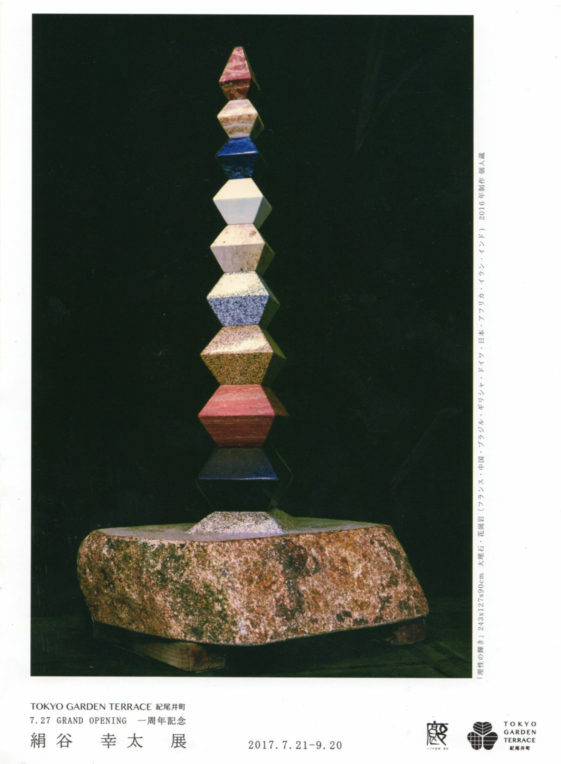 Kinutani describes his rock sculpture “creation and wisdom sculpture” and is keen for visitors to touch the pieces while viewing them in order that they can continue the rock communication that the sculptor has initiated. Even a single type of rock feels different to the touch when Kinutani has created surfaces of different smoothness and finish. In his words “I invite you to gently touch the sculpture, listen to the voices of the rocks, and trace their history back in time”. Kinutani created the work entitled The Light of Reason with the firm belief that “reason must take root in nature”. From this standpoint, and with his fervent wish for world peace, I believe his message is that world peace is balanced on a tightrope and that it is vital for us to make continual efforts to create and maintain peace, in just the same way as we need to be vigilant and focused while building up piles of rocks that could topple at any time. As a geologist, I am fascinated by the choice of rock types used in the creation of The Light of Reason. It uses ten varieties of rock from different parts of the world. From the bottom layer upwards these are: Inada granite from Japan, yellow granite from Namibia, Jurassic yellow limestone from Germany, red travertine from Iran, white marble from Greece, black granite from Africa, yellow travertine from Iran, red granite from Brazil, yellow onyx from China, and basalt/ limestone from Australia. The white rock which forms the base of the sculpture is Inada granite from Ibaraki Prefecture, the same rock used in Kanei-ji Temple in the Yanaka area of Tokyo. These rocks can be brought together in two main groups. The first group is granite, which is an igneous rock that forms after hot magma cools in the Earth, and the second group is limestone, which is a sedimentary rock that forms in the ocean and lakes (travertine and onyx are also related to limestone). As each rock has its own unique history, we can pinpoint the origin of a given stone when we look at it closely. For example, the Inada granite used in the bottom layer of the sculpture has black stones mixed in with the white granite. These black stones originally came from mudstone which formed during the Jurassic period (roughly 200 million to 145 million years ago). Later on, during the end- Cretaceous period 60 million years ago, the magma that would eventually become the Inada granite rose up from deep within the Earth and engulfed the mudstone blocks. Heat from the magma turned the weak mudstone into hard hornfels metamorphic rock. The mudstone blocks are completely different in nature to the surrounding granite and geologists call such masses xenoliths (xeno means stranger and lith means rock). Meanwhile, the Jurassic yellow limestone from Germany, which is the third layer from the bottom, is a calcareous rock which formed through sedimentation in the ocean during the Jurassic period roughly 160 million years ago, and it contains ammonites and other fossils. The topmost stone, which is from Australia, is the oldest of all the ten rocks in the sculpture and is composed of basalt created by submarine volcanic activity 3.4 billion years ago (the green section) and limestone which was buried in the basalt during the volcanic eruption (the white section). Thus, this rock is a time capsule filled with information about what the oceans were like roughly one billion years after the formation of the Earth. But all visitors bring their own knowledge and enthusiasm to the exhibition and those who are receptive to what the rocks have to say will receive their own message. Mine has been a geological message; what will yours be?